Project Goal: Provide a safer and more effective working space for our Music Ministers by: Installing Banisters across the Railing, Polishing the Brass Railing, and Renovating the Choir Rise Platform [Remove and Lower existing flooring and Install new flooring.] Savings by doing the work “in house,” will enable the upgrading of our sound system and wiring. Notes: As reported in an earlier bulletin, the bid that was received to do this work was far above what the committee expected and therefore it was not accepted. However, several talented and professional individuals on the committee volunteered to do most of the work and parish members were asked to volunteer to help with material handling and clean up. As a result, we will be able to complete this project for about 15% of the original bid. With the savings by doing the work “in house,” we plan to upgrade the sound system and wiring. Once completed this project will lead to a safer and far more effective working space for our music ministers. Choir Loft Project: Now 100% complete. 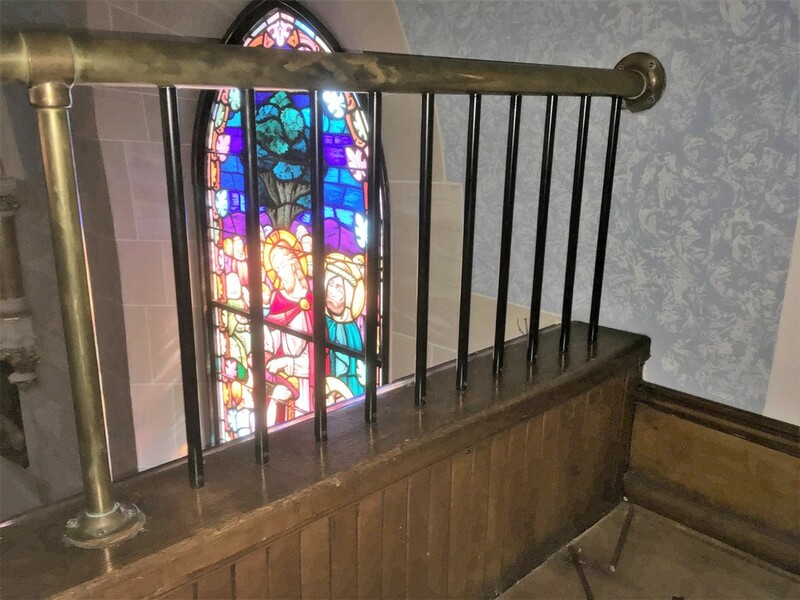 The internal Choir Loft Railings have been installed, thereby completing this project. Doing the work “in-house” resulted in 85% savings from the original bid. This savings will enable us to upgrade the sound system and wiring in 2019. Thank You to all who have offerred their services to make is a wonderful reality! Choir Loft Project: Is now 95% complete. The Painting, Flooring, Edging, and Molding of the Choir Loft is done. Remaining work is to install some side railings for the new steps from the Choir Platform to main floor and the acoustics people need to finish up their work, the electric boxes and sound connections. Flooring Installation: The Main Flooring has been installed, Beadboard painted, and new wiring completed. Choir Platform Flooring installation in progress. Project almost completed, still needs final flooring installation and side railings to be installed. Choir Loft Project: The choir loft is progressing quite nicely! The Riser and Piano Platform have been renovated, the unsafe riser is fully removed, and the floor reinforced and lowered increasing the walk-way space. The Side walk-way has been installed. The Banisters have been completely installed on the Existing Railing to provide additional safety measures and increase the Railing to Floor height. The Flooring has been received and work is in progress to install and complete the Choir Loft Renovation project during the Month of June. Many thanks to Don Portner and the team of professional volunteers from our parish, for all your work on this project! Great job everyone!!! Figure 1 : Blue Tape on floor indicates where the Riser Platform was to be cut to lower the floor back to the Railing. Notice Piano bench rests on a portable Platform and the limited walkway space. Figure 2 : The Floor to Railing Height is very limited, and additional step required to access Riser Platform creating a Safety Concern. Figure 3 : Side Walk-way with narrow Pathway and uneven Steps. Figure 4 : Riser and flooring being renovated and removal of first level. Figure 5 : After the Riser Platform and Piano Platform Removed, increasing the walk-way space. Figure 6 : Side Walk-way now expanded with even Flooring, eliminating Safety Concern. Figure 7 : Balusters Installed on Existing Railing to provide additional safety measures. Notice the increased Railing to Floor height. Figure 8 : View of Balusters from the Church Interior. Figure 9 : View of Completed Riser Platform and Baluster Renovations. Awaiting new flooring materials.